Nephrite, both the second king to appear and the second ranked king of the Dark Kingdom, appeared at the end of episode thirteen, enshrouded in shadows and vowing to do better than his newly-frozen predecessor. It was in episode fourteen where he really made his first important points. He began by telling of his alternative method of energy-gathering. Yes, I'm sure you all know. But it's so darn cool. 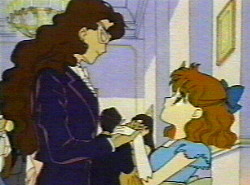 You see, according to Nephrite, the stars above have the ability to understand the people on earth. We all experience one time in our lives where we are just teeming with the valuable energy so needed by the Kingdom, and the stars, when referenced by a person who can read them, can tell when this energy peak will occur. 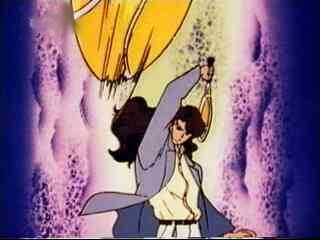 Nephrite deemed it unnecessary to use large groups of people as Jadeite did; he got plenty of energy from one person. This is what he told Queen Beryl, and indeed this was the strategy he used. And it worked. 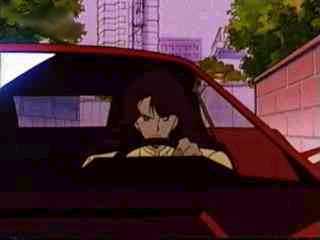 Nephrite probably would have been rather successful if he had not attempted to engage in other pursuits. Or maybe not. Who knows? The events happened as they happened. The third king, Zoisite, always seemed to hold some kind of grudge against Nephrite, for reasons undisclosed in the show. Apparently the creators decided that the motives of the petty squabbles of the heroes were necessary and the motives of the villains not. But the animosity, though unexplained, was clear. The younger king made his first appearance in the first episode where Nephrite was the main villain, effectively (and no doubt purposely) stealing some of his spotlight. Zoisite would often appear and make some kind of taunt toward Nephrite, sometimes demeaning him in front of Queen Beryl herself. It was obvious that the relationship between the two kings was not a friendly one; Nephrite considered Zoisite a nuisance, Zoisite openly desired Nephrite's downfall. Then Nephrite decided that he wanted to please the queen even more than she already was due to the energy he had gathered. He interrupted a meeting between Beryl and Zoisite, and declared that he was going to get the ginzuishou, the legendary silver crystal, because they had found that it was on earth, and earth was Nephrite's domain. There was a problem with this. Finding the ginzuishou was Zoisite's job. Now, in the Dark Kingdom, one's assignment is very important. Failure to accomplish something means one is useless, and therefore expendable. Nephrite's ambition could very easily cost Zoisite his life, and they both knew it. During this time, Nephrite was signing his own death warrant in a number of ways. He had angered a very vindictive fellow king. He had had the audacity to tell the queen to mind her own business about his work, to just shut up and watch him go. And he had a human girl that adored him, and he was leading her on. Osaka Naru was the best friend of Tsukino Usagi -- Sailormoon. 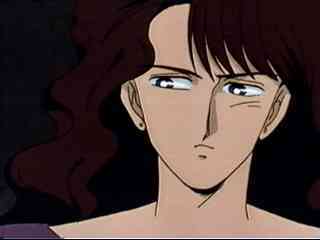 She had been crushing on the handsome Sanjouin Masato, Nephrite's alter ego, since episode fourteen. He suspected her as Sailormoon at one point, then discovered (as many future villains will) that she is absolutely full of precious energy. He leads her on, never once considering the fact that she may be affecting him like he affects her. Nephrite, using his stars, created a little black crystal called the kurozuishou. This crystal was basically a homing device for the ginzuishou, and what it showed him was Naru-chan. So he found her and tried to see if she had it. She didn’t understand him. However, Zoisite had sent a youma to spy on the auburn-haired king, and this spy, thinking the kurozuishou was the ginzuishou, decided to attack its target. Nephrite defended himself and Naru-chan, injuring the monster, and after Sailormoon finished it off (glory-stealer that she is), she used her tiara action on Nephrite himself, who had taken the liberty to attack her beforehand. Unable to dodge the projectile, Nephrite could only watch as Naru blocked the path, forcing Sailormoon to stop the tiara. Her selfless action disturbed him, but he still didn't think he cared for her. But Zoisite knew he did, and had her kidnapped. 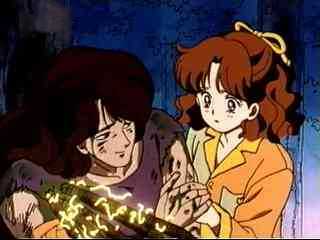 Nephrite saved the girl, and realized that she did affect him somehow. They shared a touching moment in the park, laughing about getting Sundays off and sharing a chocolate parfait in the future. And, of course, that's when the assassins came and killed Nephrite very dead. He did say to Naru, though, that he was happy to have met her, which was sweet. And yes, it does appear that he has green blood, but that's debatable. Some say it's from the thorns. I think it's his blood. After all, the kings are obviously different from normal humans... why can't he have weirdly colored blood? His death scene is touching. I personally prefer the next death to occur, but this one is quite touching. And my, wasn’t that a heckuva summary? 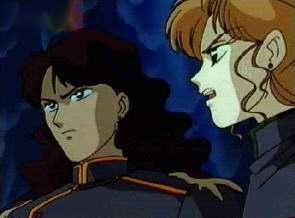 Nephrite as a character was more developed than Jadeite, and he actually became quite sympathetic at the end. Many Sailormoon fans who watch the show for the senshi find Nephrite as rather likable as a villain, perhaps because of his "conversion" to the "good" side. Of course, there are also those who say that Neph was a pathological liar, and that he had lied the entire time to Naru, never telling her the truth even at the end, that he never cared for her. I like Nephrite, much more than I used to. He's kind of grown on me -- I used to detest him. Now I like him more than Jadeite (poor Jed-chan! ), making him my third favorite character on the show overall. Rather than teleporting and floating around, he drives a hot red sportscar. He plays tennis. He drinks. He lives in a mansion. He charms women left and right. He keeps the power of the Stars at his fingertips. He has a nifty symbol that means nothing but is easily recognizable as his own. If he were real and I had the chance to meet him, I'd run behind him and bounce his long curly hair with my fingers. I'm not sure why. But it's long been a fantasy of mine. Is Nephrite a drunk? Come on, he only is shown drinking once. Of course he is! No, no, there is no proof, though he certainly has enough pressures to drive him to drink. And he's a grown man; he's allowed. Most consider him the second-ranked king presumably because of the epaulettes on his shoulders. This assumption is generally made to signify rank: it seems that the more decoration on the uniform, the higher the wearer's position. Making Zoisite and Jadeite's rank indiscernible. Oh well. This is a Nephrite shrine, after all. And I guess Neph's pretty powerful, too, what with all of those nifty star-powers, though he doesn't quite have the invincibility that the highest-ranked king has. Anyway. Sanjouin Masato is a pretty neat persona, and is an improvement on Jadeite's large number of disguises. This sort of reflects their energy-gathering styles: Jed uses a lot of costumes to steal energy from a lot of people, while Neph uses one costume to drain one person at a time. And Sanjouin-sama (as dear, sweet, innocent Naru-chan initially calls him, before she finds out Nephrite's real name), to me is the ultimate manifestation of Nephrite's refined tastes. In the Dark Kingdom, he's overtly asocial, behaving either aloofly or downright rudely to the others who live there. But get him out on the earth, and somehow the DK recluse turns into a roaring socialite, flirting, laughing, speeding around in that little sportscar, going to dances, playing tennis, and just overall being a charming guy. So what's up with that? 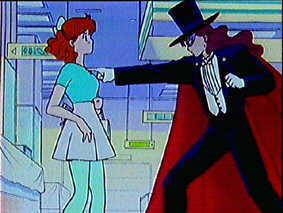 One thing that was even more embarrassing in Neph's career, though, was his masquerade as Tuxedo Kamen . The hair's just a little bit recognizable, and also, eww. Tuxedo Kamen. I mean, I think Tux is all right... but Nephrite as him is just wrong. I mean, Zoisite did a better job pretending to be Sailormoon! Granted, I'll bet Zoi worked much, much harder on the illusion (and he had Kunzite to help him out), and Nephrite was just going with what the stars told him -- that Tuxedo Kamen is Sailormoon's greatest weakness -- but still, couldn't he have used a youma, or something? Oh well. Who am I to judge? I've always imagined the Dark Kingdom motto to be something like "Whatever works!" (they certainly behave that way! 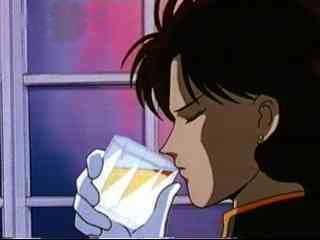 ), so Nephrite was just doing the best he could. And the sad thing is that that is one of the episodes where I like the animation; I like most of Nephrite's, but I really don't like the one with the dolls, and I don't like some parts of the one where he dies. Some parts of that one -- the one that killed him -- are beautifully shadowed, but some scenes also bother me. I think it's the profiles. However, the voice acting in that episode (the one where he dies, that is) is spectacular, even if Nephrite's voice is my least favorite of those of the four kings. It's still good. A fun villain, Nephrite allowed development and an actual importance in the plot, as we follow in his journey to find the part of this debonair, gutsy creature that isn't evil, making the discovery right along with him. Oh, wait, no, that's golf. Dang it, stars, you don't know everything after all, do you?